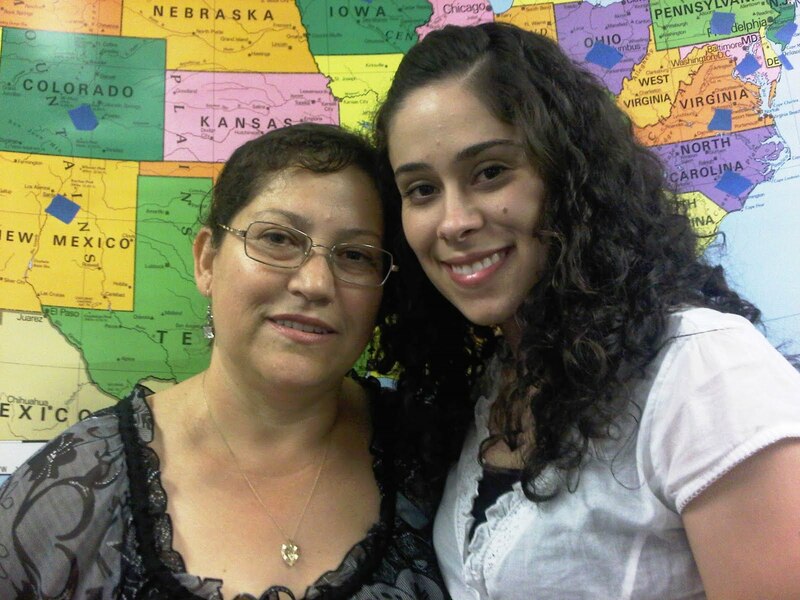 New Citizen Maricela Alvarez with her daughter and a grandson on the way! 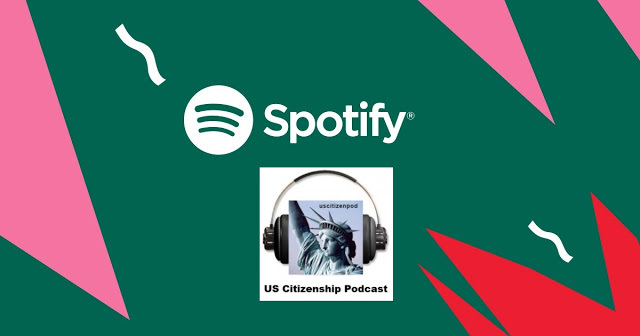 The Dream Act (short for Development, Relief and Education for Alien Minors) addresses the plight of some 2 million illegal immigrants brought to the United States as children by their undocumented parents. The provision would allow them to earn their green cards if they maintain "good moral character," graduate from high school and complete two years of college or serve in the military. The legislation is supported by the U.S. military and the president, but it won't be moving forward for now. VOA's Laurel Bowman has more. West Wing Week: 9/24/10 or "Immeasurable Courage and Uncommon Valor"
WH.gov: West Wing Week: 9/24/10 or "Immeasurable Courage and Uncommon Valor"
Milpitas Adult School student, Minire Karamanaga (formerly of Yugoslavia) talks about her US Citizenship Interview on Tuesday, September 21, 2010. Congratulations! A new law in the southwestern border state of Arizona requires police to check a person's immigration status while enforcing other laws. A federal judge's ruling now blocks key provisions of the law, but it remains a controversial issue, especially within Arizona's Hispanic community ahead of upcoming state and federal elections. VOA's Greg Flakus reports. 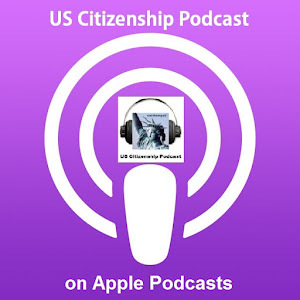 The Development, Relief and Education for Alien Minors Act (The "DREAM Act") would benefit students who are currently undocumented in the United States of America. The Dream Act is based upon earned legalization. The DREAM Act is Education for our future generation of leaders. If busy, call switchboard directly at 1-202-224-3121. Ask to speak with one of the senators on the list and you will be transferred. 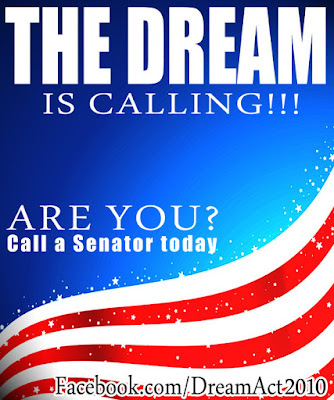 "Hi, I am calling to ask that Senator _______ vote for the DREAM Act amendment to the Defence Authorization Act. It is the common sense approach to revitalizing the economy and strengthening our armed forces." Make no mistake, every single call counts! Spread the word with your friends and family. For decades the nation has endlessly debated how to solve the problem of illegal immigration. One side calls for aggressive enforcement of existing laws. 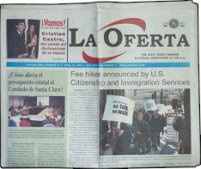 The other side calls for "comprehensive immigration reform." But while the debate rages, millions of American children are left with the real possibility that their undocumented parents will be detected and deported. For the past year, a Mercury News reporter and photojournalist followed a San Mateo family on their emotional journey through the U.S. immigration system. Both parents came here as illegal immigrants, but all six of their children are American citizens. Summer vacation is ending and students at American schools and colleges are getting ready to head back to class. In previous years, many of them would have been taking French or Spanish as a second language. 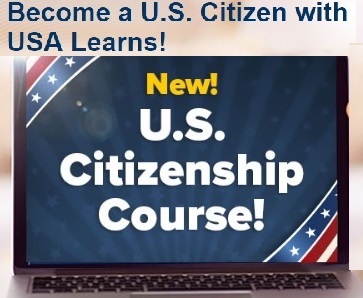 But as VOA'S Mana Rabiee reports, knowledge of Arabic or Farsi is now considered "critical" to U.S. national security and more Americans are learning these languages today than ever before. 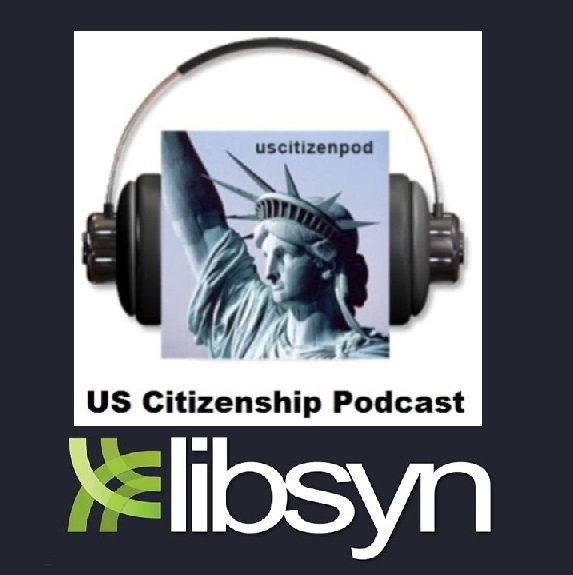 09/17/2010--In honor of Constitution Day and Citizenship Day, the USCIS officially launched the Citizenship Resource Center—a Web-based portal that centralizes citizenship resources for immigrants, educators and organizations. 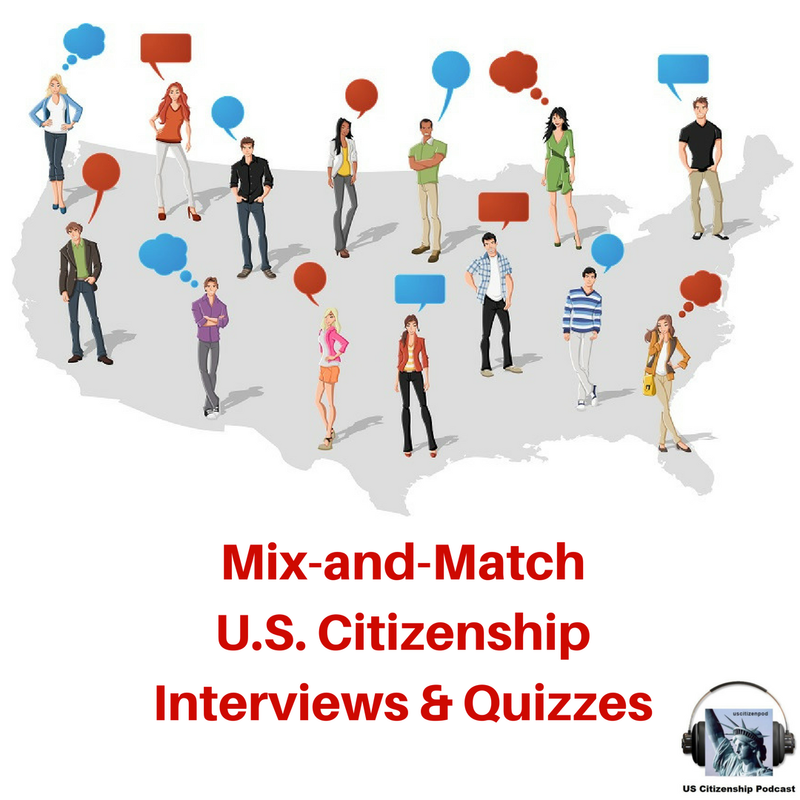 This free, easy-to-use website will help users better understand the naturalization process and gain the necessary skills to be successful during the naturalization interview and test. 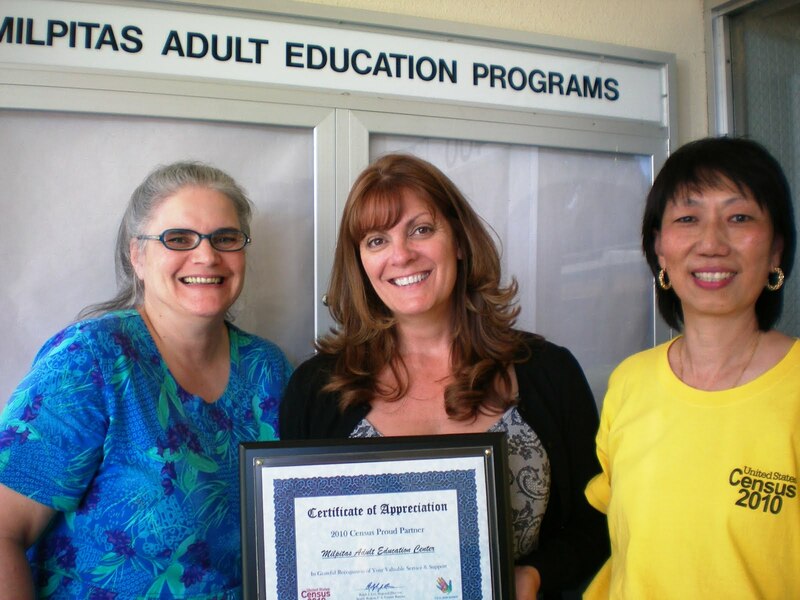 Since the beginning of the semester, Milpitas Adult School has been studying the US Constitution in preparation for signing the Constitution on Constitution & Citizenship Day, September 16-17, 2010. VIVA Mexico's Bicentennial of Independence! After the Civil War, the 15th Amendment gave the right to vote to all male US Citizens. However, some communities refused to allow certain minorities to vote. Women could not vote until the 19th Amendment (1920). The Chinese Exclusion Act which took away the right to vote from US native-born citizens of Asian ancestry was repealed in 1943. 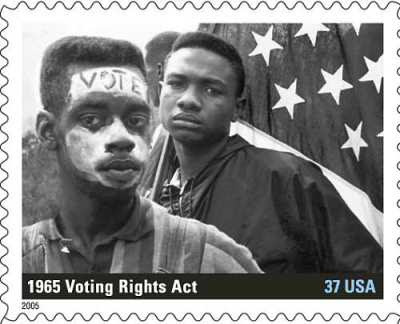 Jim Crow laws in the Southern United States which strongly discouraged African-Americans to vote was repealed by the 24th Amendment, 1964 & the Voting Rights Act 1965. The Nineteenth Amendment gave suffrage (the right to vote) to women. 24th Amendment made it illegal to make a citizen pay a voting fee. 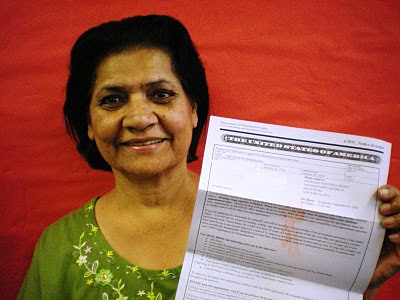 It is illegal to make a citizen take a reading test to vote. The 24th Amendment (1964) and the Civil Rights Movement led by Rev. Dr. Martin Luther King, Jr. crushed Jim Crow laws which discriminated against African Americans. VOANews: Civil Rights Movement: In the '60s, a Struggle for Equality in US: Activists marched, held sit-in protests and led "freedom rides" to demand better treatment of black Americans. Martin Luther King Junior lived by the idea of nonviolence, but his murder led to riots in more than 100 cities. 26th Amendment: US citizens who are 18 years old or older have the right to vote. 1971. Richard Nixon lost the 1960 election to John Kennedy, but he was known for his ability to fight, to lose, and to keep trying. Those skills would soon be tested. Here is a pdf of Voting Rights. Here is a pdf of Voting Cloze Essay. 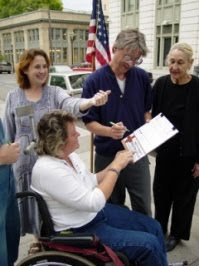 The First Amendment to the United States Constitution is a part of the United States Bill of Rights that protects freedom of speech, freedom of religion, freedom of the press, freedom of assembly, and the right to petition. The Premble lists the reasons that the 13 original colonies separated from their mother ountry, and became an independent nation. Here is class handout of a Summary of the US Constitution. 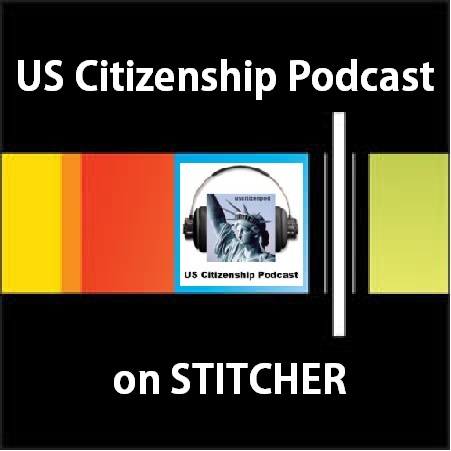 Here is a slide show of the US Constituion. Constitution Day (or Citizenship Day) is an American federal holiday that recognizes the ratification of the United States Constitution. 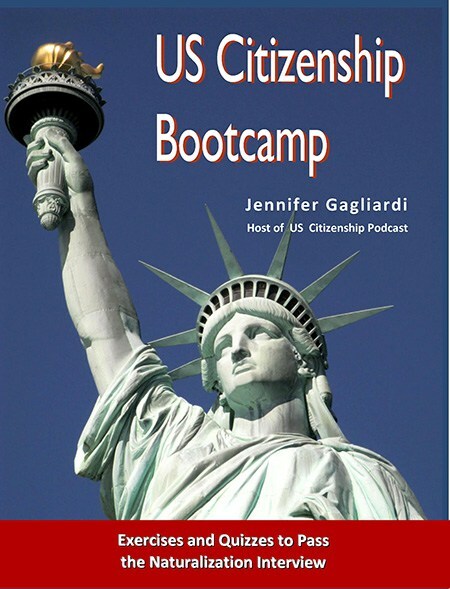 Citizenship Day also recognizes all who have become citizens due to either coming of age or naturalization. 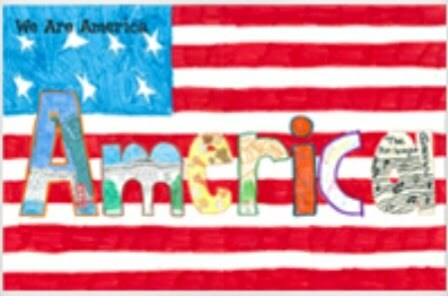 It is celebrated on September 17, the day the U.S. Constitutional Convention signed the Constitution in 1787. Before Constution Day, students study the US Constitution, focusing on the rights and responsibilites of American Citizenship. On Constitution Day, students sign a large copy of the Constitution and are given pocket-sized copies of the Constitution. Many Adult Schools honor the students who were naturalized as American citizen during the previous school year. The school also encourages the students who are preparing for naturalization during the upcoming school year. 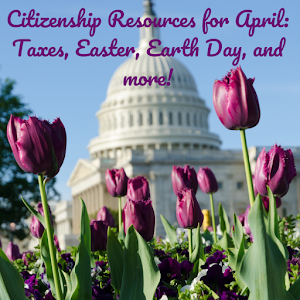 Check back every day for updated materials for Constitution Day. Here are some pictures from last year's celebration 0, 1, 2, 3, 4, and 5. In a White House news conference Friday, President Barack Obama said that nine years after the 2001 terror attacks on the United States, he wants Muslims around the world to understand that America is not at war with Islam. VOA chief White House correspondent Dan Robinson reports, Mr. Obama spoke about controversies involving religion, the planned closing of the US facility at Guantanamo Bay, upcoming Israeli-Palestinian peace talks and the US economy - during a long exchange with the media. The President, The First Lady and the Vice President attend memorial ceremonies in remembrance of September 11th. The emotional ceremonies are conducted at Twin Tower site in New York City, the Pentagon in Washington D.C. and the Flight 93 crash site, a National Memorial in Shanksville, PA. Welcome to the West Wing Week, your guide to everything that's happening at 1600 Pennsylvania Ave. This week, walk step-by-step with the President as he celebrates Labor Day in Milwaukee, welcomes the Secretary-General of NATO, outlines plans to grow the economy in Cleveland and much more. 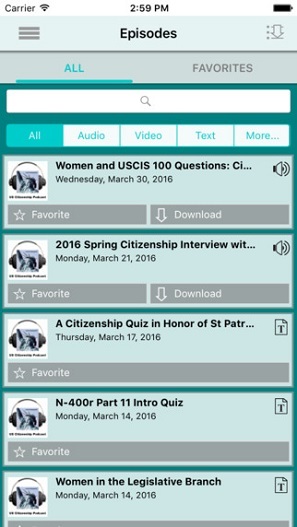 Archived audio files take a couple of minutes to load. Please be patient! Here is handout about the State of California. 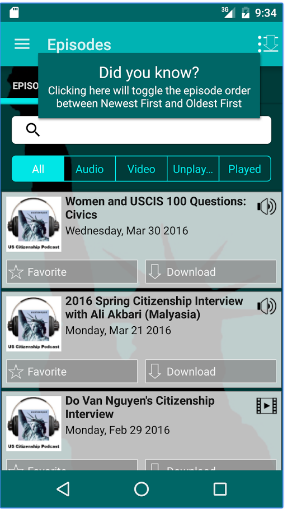 Also see EL Civics.com's excellent lessons on the State of California. As the Labor Day (September 6) holiday approaches in the US, two widely differing views arethe subjects of an intense debate about the state of American workers. The US Chamber of Commerce claims the Obama administration's economic policies have created barriers to job creation. But prominent labor groups blame corporate greed and lax regulations for hurting the prospects of middle class Americans. Mil Arcega reports. 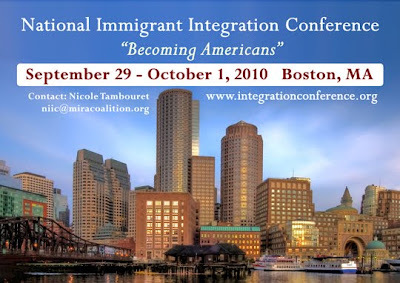 The 2nd Annual National Immigrant Integration Conference (NIIC) will be held in Boston, Massachusetts September 29-Oct 1, 2010. The 1st NIIC was an extremely successful event bringing together over 300 stakeholders: policy makers and community based organizations, service providers and the government sector. The Denver conference focused on moving integration efforts forward at the local, state, and national level. The Boston conference will have a similar focus, emphasizing promising practices around integration initiatives, citizenship, language, workforce development and public education. Outstanding leadership will explore the impact of immigrants on the economy, public schools, public safety and elections among a host of keynote speeches and workshops. A fun city for a fall conference, Boston invites you to discover its ethnic neighborhoods and historic sites and take part in a naturalization ceremony held at the opening reception on Wednesday, September 29. 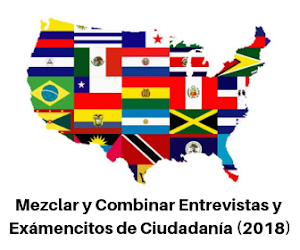 How is immigrant integration emerging as a national agenda? With an increasing number of states and municipalities addressing their changing demographics, what are the successful practices and positive impacts emerging from communities across the country? What are the implications of the current federal government priorities for addressing immigrant integration and immigration reform? What does an uncertain fiscal environment mean for integration efforts? 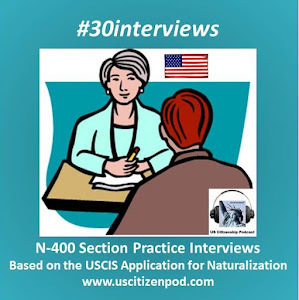 Why is the naturalization rate relatively low and what can or should be done? 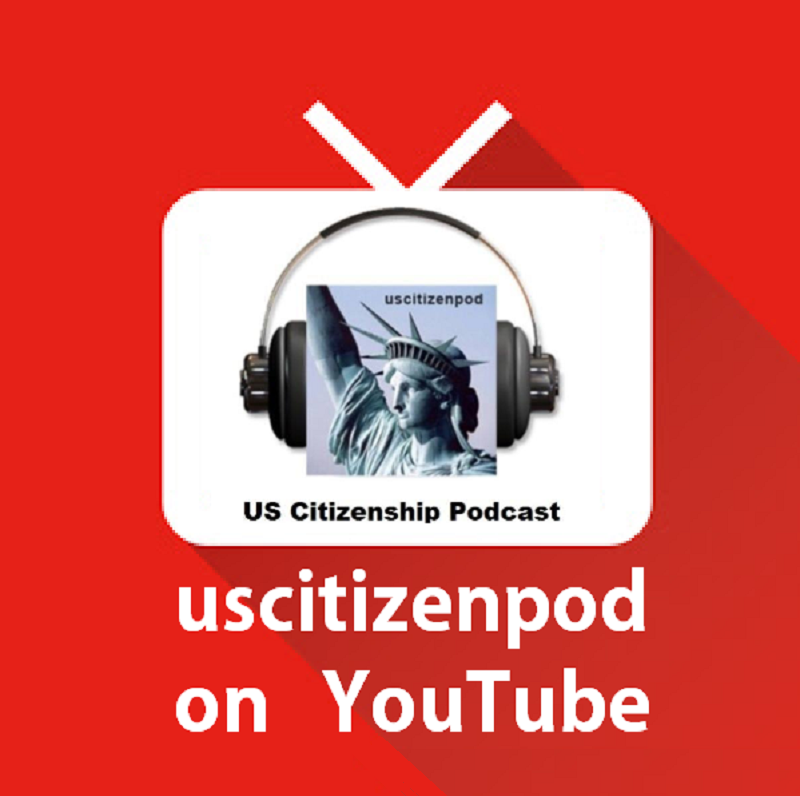 What is an American and who is shaping the next generation? 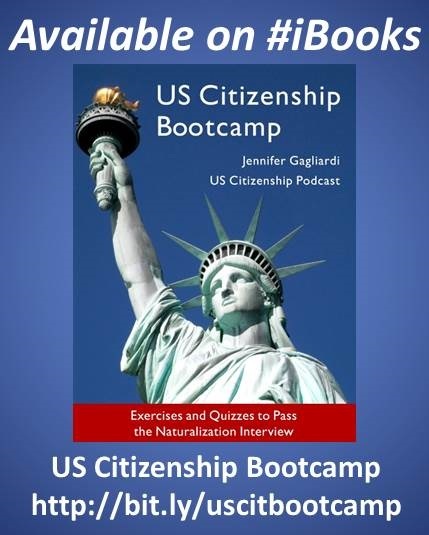 The launch of a free online Citizenship Resource Center to help applicants and educators prepare for the naturalization process and test. September promises to be an exciting month. Please join us in celebrating Constitution Day and Citizenship Day this year and take a moment to reflect on the enduring promise of America and what it means to you. WH.gov: West Wing Week: "Dispatches from Iraq"
This week the President announced the end of America's combat mission in Iraq and West Wing Week takes you there, on the ground, with an in-depth, behind-the-scenes look at the change of mission. We spent a week on the ground with our troops and civilians , some coming home, some staying for the next mission, training and supporting the Iraqis now that they have the lead in protecting their own country. Mrs Noor is ready to go to her interview! A change of command ceremony was held in Baghdad Wednesday (September 1) to mark the end of U.S. combat operations in Iraq. Vice President Biden and Defense Secretary William Gates were on hand to mark the transition to what the military calls stability operations. VOA's Jeff Swicord reports.